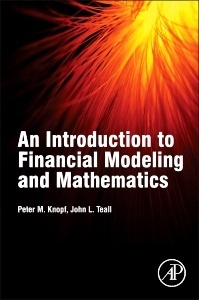 Risk Neutral Pricing and Financial Mathematics Knopf Peter M., Teall John L.
Auteurs : Knopf Peter M., Teall John L.
Risk Neutral Pricing and Financial Mathematics: A Primer provides a foundation to financial mathematics for those whose undergraduate quantitative preparation does not extend beyond calculus, statistics, and linear math. It covers a broad range of foundation topics related to financial modeling, including probability, discrete and continuous time and space valuation, stochastic processes, equivalent martingales, option pricing, and term structure models, along with related valuation and hedging techniques. The joint effort of two authors with a combined 70 years of academic and practitioner experience, Risk Neutral Pricing and Financial Mathematics takes a reader from learning the basics of beginning probability, with a refresher on differential calculus, all the way to Doob-Meyer, Ito, Girsanov, and SDEs. It can also serve as a useful resource for actuaries preparing for Exams FM and MFE (Society of Actuaries) and Exams 2 and 3F (Casualty Actuarial Society). Upper-division undergraduates and first-year graduate students worldwide in financial engineering, quantitative finance, computational finance and mathematical finance. Also professionals working in financial institutions, insurance, and risk management. Peter Knopf obtained his Ph.D. from Cornell University and subsequently taught at Texas A&M University and Rutgers University. He is currently Professor of Mathematics at Pace University. He has numerous research publications in both pure and applied mathematics. His recent research interests have been in the areas of difference equations and stochastic delay equation models for pricing securities. John Teall is a visiting professor at LUISS Business School in Rome, Italy. He is a former member of the American Stock Exchange and has served as a consultant to Deutsche Bank, Goldman Sachs, and other financial institutions.